THE END OF THE WORLD IS COMING. PLAY NOW. OR WE ALL LOSE. 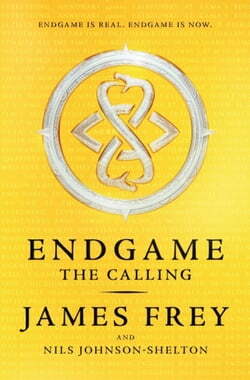 The first book in a game-changing new series by... read more bestselling author, James Frey. Bryan High School, Omaha, Nebraska: Sarah stands at her graduation ceremony - perfect SATs, a star athlete, her life ahead of her. Then a meteor wipes out half her school. But Sarah is not hurt and not surprised. Because she is the Player of the 233rd line - the Cahokian. And she knows what this means. Juliaca, Puno, Peru: Jago walks the streets after the meteor hits. There's looting and violence but he's not scared. He is the Player of the 21st line - the Olmec. And he's ready. China, Australia, Turkey... Twelve meteors fall. Cities and people burn. The news is full of the end of the world. But Sarah, Jago and ten others are already plotting and planning for the fight. They are the Players and Endgame is here. Written into this book is a puzzle. Solve the puzzle, and you will find the key to open a case of gold. Read the Books. Find the Clues. Solve the Puzzle. Who will Win?